GSSSB Bin Sachivalay Clerk Recruitment 2017-18 Notification along with online application form to fill up 360 Bin Sachivalaya Clerk Post will be available soon on this page. The Revenue Department has requested the demand for fill in space. Keep Visit this page for more details about Bin Sachivalay Clerk Bharti 2017-2018 Notification, Important Date and Links. 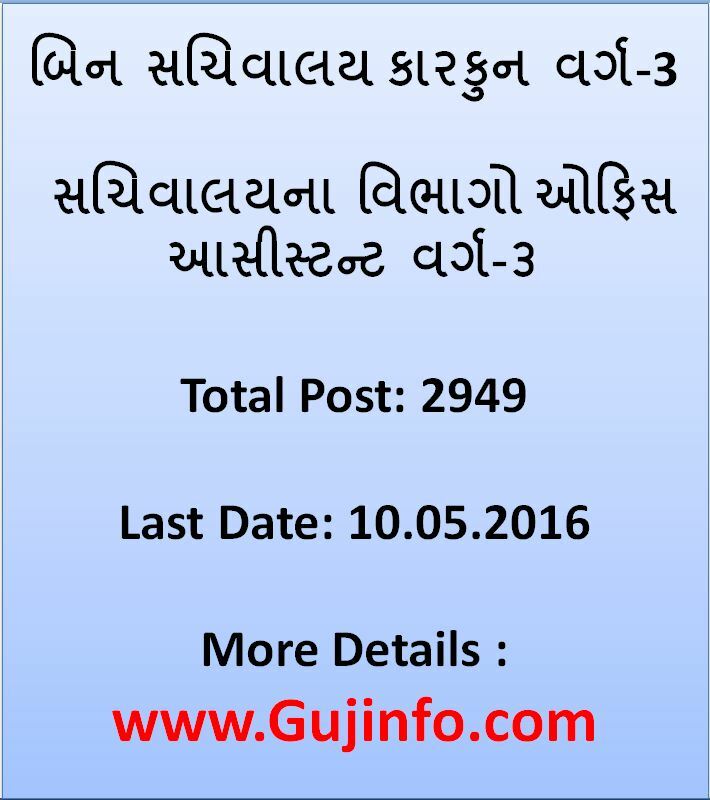 GSSSB Bin Sachivalay Clerk Recruitment 2016 Notification along with online application Form to fill up 3000 Bin Sachivalay Clerk Posts is available soon at ojas.gujarat.gov.in. GSSSB Bin Sachivalaya Karkun Recruitment 2016: The Gujarat Secondary Service Selection Board, Gandhinagar, Gujarat has issued an Employment Notification for the Recruitment of Bin Sashivalay Clerk Posts for filling up of 2949 vacancies on its official website at ojas.gujarat.gov.in. Eligible candidates are invited to fill online application form for said post whose link is made available at same portal as mentioned above. Recently Gujarat Post department has released big advertisement as Gujarat Post Office recruitment 2016 at official website www.gujpostexam.com. This job recruitment updates bring good news for all those candidates who were looking for latest govt jobs in Gujarat. Latest Update on 14-03-2016: According to the circular Bin Sachivalay Clerk Class-3 Recruitment Notification will be published on 21-03-2016 at ojas.gujarat.gov.in and atwww.gsssb.gujarat.gov.in. Now all those candidates who were willing to participate in this recruitment process have to fill registration form with all required details through online mode and submit it before last dates. As per our advise interested candidates are advised to refer following mentioned details such as age limit, education qualification, selection process, application procedure, application fee, pay scale etc are mentioned below. Find and click on GSSSB Binsachivalay Clerk Bharti 2016 Link. Fill the online application carefully as per your personal and Qualification details. Take printout of your application and keep it with yourself for future reference. Candidates are advised to keep on visiting this page regularly for Bin Sachivalay Clerk Recruitment 2016. We will updates this page and bring you GSSSB Bin Sachivalay Clerk Bharti details like Notification, Syllabus, Exam Pattern, Study materials, Online Apply link as soon as possible. Follow the link given below to download GSSSB Bin Sachivalay Clerk Notification 2016.
dear sir plzz meraliye koi job ho to dekho me 12th pass hu muje arjent jarurat hai sachivalay me jaga ho to bhi dhekho na sir plzzz reqwest…. Dear,sir muj arjant job ki jarurat he, mene 12th pass hu or mene aage dabal diploma kiya he or aage abhi external arts running he to ho sake to mere layak job ho to please sir I requvest for you…. where are you leaving. in many fields there was job. 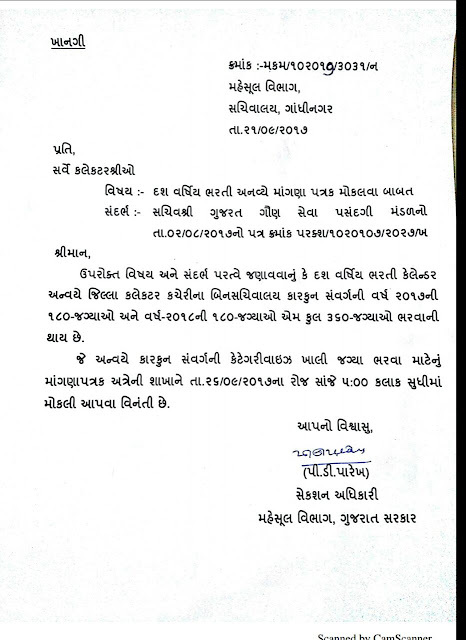 Block no:19/20 preeyna sociyatiy,ramapirna mandir ni baju ma thakkar nagar ahemdabad.